"Tips for designing an energy-efficient building"
"Toward a sustainable future in South Lake Union"
"Historic preservation projects can be green"
"Low-impact development gets a test in Renton"
"Smart lighting design: go for timeless, not trendy"
"Brownfield project demonstrates Seattle's creative know-how"
"3 advances show the future of site development"
"What does a sustainable school cost?" Residents of the Alcyone in South Lake Union share an 800-square-foot rooftop garden irrigated with recycled rainwater. The GGLO-designed project was completed by Rushforth Construction in 2004. 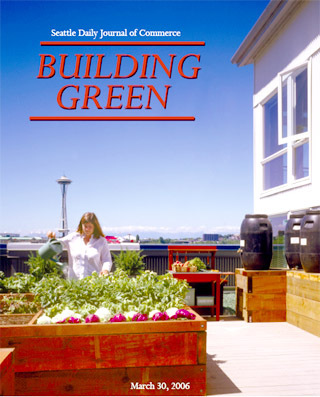 This issue of Building Green keeps an eye on the future while remembering the past. We talk about incorporating green techniques in historic preservation and using lighting design that is more timeless than trendy. We take a moment to envision a sustainable future for South Lake Union, and discuss advances that point the way toward the future of site development. Projects involving low-impact development in Renton and fixing up brownfields in Seattle neighborhoods show us how building green theories can be put into practice. Finally, we offer some tips for energy-efficient design, and talk about the costs of building sustainable schools. Copyright ©2006 Seattle Daily Journal and DJC.COM.